Shriners are distinguished by an enjoyment of life and a commitment to philanthropy. They support the The Shriners Hospitals for Children, a network of 22 pediatric specialty hospitals operated and maintained by the Shrine, that has been called the “World’s Greatest Philanthropy”. The Shrine has always been made up of the finest type of men in any community – men whom you are glad to know and work with; men who travel by preference on the sunny side of the streets and who play a fair game all the time. They expend every effort in this work and also their play, but they know when to apply the brakes. They sow kindness and reap happy friendships. Shriners are distinguished by an enjoyment of life and a commitment to philanthropy. They enjoy parades, parties, fellowship, dances, dinners, trips, cruises, sporting events and other social occasions. They support the The Shriners Hospitals for Children, a network of 22 pediatric specialty hospitals operated and maintained by the Shrine, that has been called the “World’s Greatest Philanthropy”. 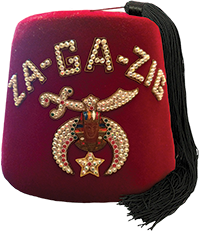 Pay your Za-Ga-Zig Shrine dues online. A 5% convenience fee has been added for the expense of credit card transactions.